Interval training alternates bursts of intense activity with periods of lighter activity. The high intensity parts of interval training are usually at or close to anaerobic level, which means that your training requires more oxygen than you can inhale and the body starts producing lactate. The low intensity parts of the training are at an aerobic level, which means that you can inhale enough oxygen to fuel the training. This provides a great cardiovascular workout and helps you improve your aerobic capacity and train for a longer time and at a higher intensity. The “stop and start” pattern of interval training improves your recovery time, which will increase your ability to run faster for a longer time. Aerobic interval training allows you to burn more calories in a shorter period of time (1). 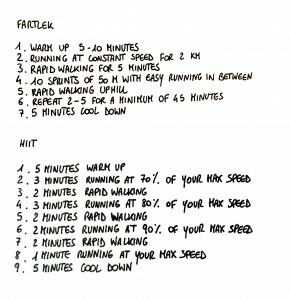 Interval training improves your aerobic capability at a faster rate than a training with a continuous intensity (2-3). Interval training is less monotonous than a continuous intensity training. What are the effects of interval training on your aerobic capability? It will enhance your lactate threshold (the limit above which lactate accumulates increasingly in the blood), which is important for long distance running competitions. It will increase your VO2max (maximal rate of oxygen uptake per minute), which means that you can take up more oxygen during your training and thereby increase your ability to sustain longer aerobic trainings. Interval training will help you manage risk factors for many diseases including metabolic syndrome, diabetes, obesity and cardiovascular diseases (4-7). 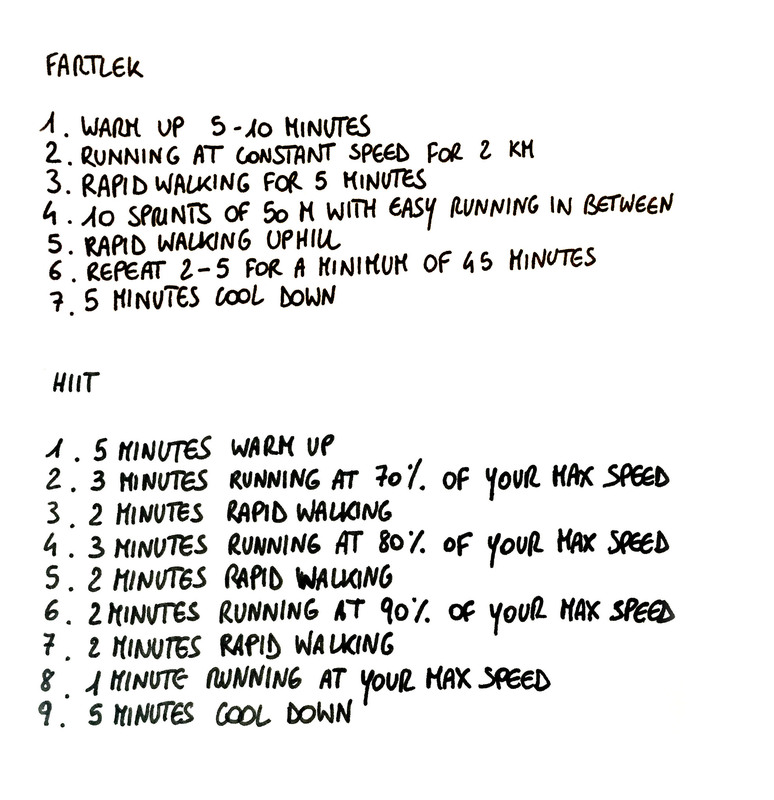 Fartlek: developed in Sweden, it’s a training schedule with mixed interval training and with regular distance training. This is great because it will allow you to train for the kind of running you need when you will do specific sport activities. Walk-sprint routine: this is a very useful training for runners and it includes sprints of a short distance (from 100 to 800 meters depending on your goal distance) and then the same distance at walking speed for a certain amount of times. For example 100 meters walking (warm up) then 100 meters of sprint, 100 meters of sprint and so on until you reach your goal distance. This routine will improve your general speed and also improve your final sprint ability in the end of a longer race. High intensity interval training (HIIT): this type of interval training applies the same concepts but decreases the volume of the training session compared to Fartlek or Walk-sprint routines. To compensate, it requires an increased effort during the high intensity parts. This entry was posted in Running and tagged interval, personal, trainer, training, träna, tränare, träning. Bookmark the permalink. I really like your way of blogging. I bookmarked it and will be checking again soon. I love what you are up to. Clever work! Keep up the wonderful work, I’ve added you to the list of blogs I read.